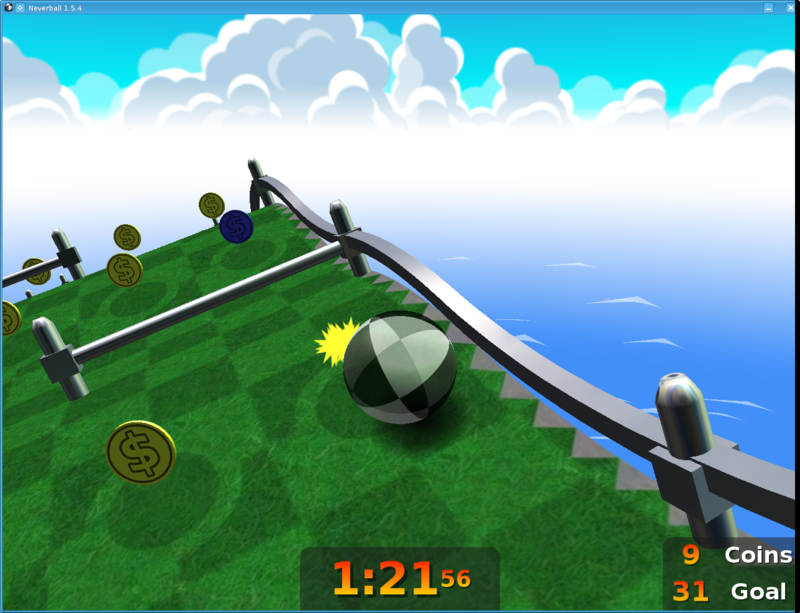 Neverball is a game with a simple concept that can be a little difficult to envision. I want you to imagine a game which combines pinball with a 3-D maze and a Mario-esque focus on collecting coins. Our role, as the player, is to guide a large pinball around a playing field by tilting the environment. We tip the environment and the ball crashes into coins. 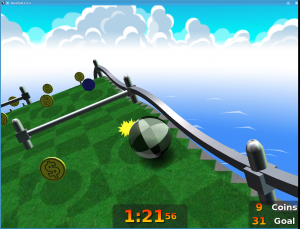 We cause the ball to collect a certain number of coins and then steer the ball toward the nearest exit before a timer runs out. Each level offers a different maze, a different number of coins we must collect and a different time limit. The possibilities are virtually endless as far as map layouts and challenges are concerned. The concept, while simple, offers a great deal of diversity and the game comes with many levels of varying degrees of difficulty. Beginner levels are basically small, open environments with a few coins while more advanced levels are sure to drive many people into the insane asylum. The controls are few in number. The mouse or the keyboard’s arrow keys cause the playing surface to tilt and the first three function keys (F1, F2, F3) allow us to change the way the camera following the pinball operates. The game’s concept is simple and fun, the style of game play allows for a virtually limitless series of levels and the controls are few in nature. All of this seems like a winning formula and, based on reviews I’ve read from other players, I think the Neverball creators have found something that appeals to a wide audience. Unfortunately I could not get into the flow of the game. Mostly I think my issue was with the way the game’s camera behaves. There are three camera modes which allow us to follow the pinball in different ways. None of them felt smooth or intuitive to me and so I was constantly trying to keep up with which way was forward or back or to the side. The shifts in perspective kept me off balance. I also found the controls for tilting the environment were quite touchy. I tried playing Neverball with both the mouse and the arrow keys. In both cases I felt the controls were overly sensitive and a tiny adjustment would send my ball flying off to a new corner of the playing field. In short, Neverball is a neat idea and it combines a simple concept with dozens of unique challenges. I think a lot of people will enjoy this game. I personally feel the controls and camera could use some polish, but I believe if people can get used to the way the game’s camera moves then they will have a lot of fun with Neverball.